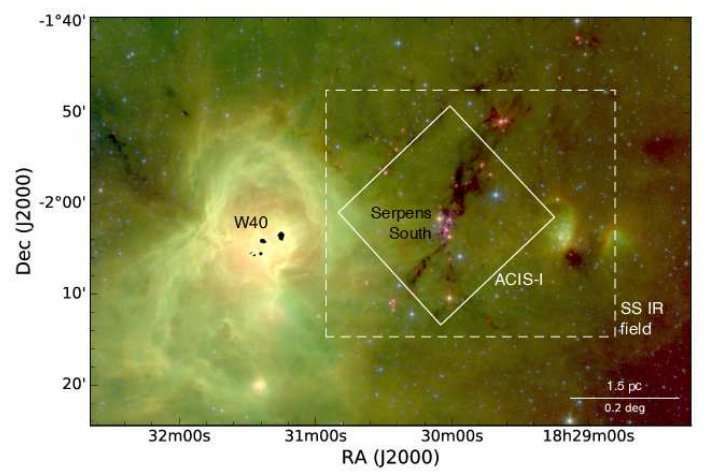 Spitzer IRAC and MIPS three-colour image of the Serpens South and W40 region, blue: 4.5 µm, green: 8.0 µm, red: 24 µm. The dark dust filament running through Serpens South is clearly visible, even at 24 µm. The inner box outlines the Chandra ACIS-I field of view, while the outer dashed box outlines the Serpens South IR field. Credit: Winston et al., 2018. Using NASA's Chandra X-ray Observatory, astronomers have identified 152 X-ray sources, including 95 new young stellar objects (YSOs) in Serpens South star-forming cluster. The finding is detailed in a paper published April 13 in the arXiv pre-print server. Located around 1,400 light-years away from the Earth, Serpens South cluster is a young and deeply embedded region of low-mass star formation. Astronomers estimate that it is about five light-years wide and contains more than 600 young stars. Previous observations of Serpens South suggest that it is the youngest known such region in the local galaxy when it comes to the fraction of its pre-main sequence fraction stars. This makes the region an excellent target for studies regarding disk evolution in clustered environments. One such study has been conducted by a team of astronomers from the Harvard Smithsonian Center for Astrophysics (CfA), led by Elaine M. Winston. The researchers employed the Chandra space telescope to examine the structure and disk properties of Serpens South at the earliest stages. The observations allowed them to update the stellar census of this cluster. "We have undertaken a Chandra X-ray study of the Serpens South star forming cluster. (…) In total, 152 X-ray sources are detected," the researchers wrote. As noted in the paper, the study resulted in identifying 152 X-ray sources. Additionally, 66 out of 152 X-ray source were matched to an infrared counterpart, using the data provided by NASA's Spitzer space telescope and by the Two Micron All-Sky Survey (2MASS). Out of these 66 sources, 21 were classified as class I sources, 6 as flat spectrum, 16 as class II objects, and 18 were identified as class III diskless members of the cluster. The remaining five sources remain unclassified. Furthermore, the study conducted by Winston's team resulted in detecting 95 new YSOs. 35 were identified out of the 66 infrared-matched X-ray sources, while the rest are reported as the newly resolved YSOs in infrared. Finding such objects is important for astronomers, as the distribution of YSOs in young clusters like Serpens South offers hints about the formation history of the region, as well as the relative age of sub-clusters. It could also disclose whether any external triggering is likely to have occurred in the cluster. In particular, the researchers noted that "it is therefore of great importance to determine whether an older population of class III diskless YSOs exists in this young cluster and what proportion of the clusters young stars have reached this stage in their evolution." They added that such studies are important to distinguish between the temporal evolution of circumstellar material. Besides detecting new YSOs, the scientists also identified in Serpens South. According to the paper, the three central sub-clusters are knots of star formation along the central filament. The fourth was found to the West. However, the researchers emphasized that there is a possibility that this sub-cluster is not associated with Serpens South. We present a Chandra study of the deeply embedded Serpens South star-forming region, examining cluster structure and disk properties at the earliest stages. In total, 152 X-ray sources are detected. Combined with Spitzer and 2MASS photometry, 66 X-ray sources are reliably matched to an IR counterpart. We identify 21 class I, 6 flat spectrum, 16 class II, and 18 class III young stars; 5 were unclassified. Eighteen sources were variable in X-rays, 8 exhibiting flare-like emission, and one periodic source. The cluster X-ray luminosity distance was estimated, the best match was to the nearer distance of 260pc for the front of the Aquila Rift complex. The NH vs. AK ratio is found to be ∼0.68x1022, similar to that measured in other young low mass regions, but lower than that measured in the ISM and high mass clusters (∼1.6-2x1022). We find the spatial distribution closely follows that of the dense filament from which the stars have formed, with the class II population still strongly associated with the filament. There are four sub-clusters in the field, with three forming knots in the filament, and a fourth to the west, which may not be associated but may be contributing to the distributed class III population. A high percentage of diskless class IIIs (upper limit 30% of classified X-ray sources) in such a young cluster could indicate that processing of disks is influenced by the cluster environment and is not solely time-scale dependent.